Bangladesh's opposition leader Kamal Hossain addresses a press conference after his motorcade was allegedly attacked in Dhaka, Bangladesh, Friday, Dec. 14, 2018. 2018 has produced some unexpected election results in Asia, halting democratic backsliding in the Maldives by unseating President Abdulla Yameen and ending the 61 years of authoritarian rule of the United Malays National Organization in Malaysia. Following Malaysia’s model of peaceful transition to multiparty democracy, all eyes are on the political developments in another moderate Islamic democracy — Bangladesh. On December 30, over 100 million voters will cast their ballots for 300 parliamentary positions in another Asian country that has allegedly moved away from democracy over the past decade, despite steady improvements in economic indicators. This year’s election is historic for several reasons. It is being held on 30 December, the month when millions celebrated the country’s 48th victory day. The previous national election was boycotted by the main opposition and ended in bloodshed. This time, the opposition is determined to participate in the election at any cost. Like Malaysia’s Mahathir bin Mohamad, the challenger in Bangladesh this time is a former member of the ruling party. 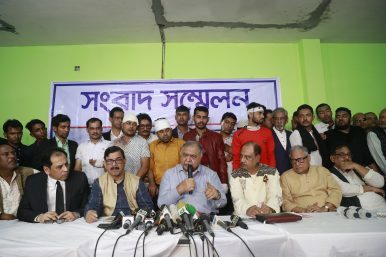 Dr. Kamal Hossain, the lead author of the country’s constitution and a close associate of the country’s founding father Sheikh Mujibur Rahman, has formed a credible coalition to unseat the government of Sheikh Hasina. The incumbent government therefore faces a difficult choice. Failure to organize a credible election will undermine the rule of law, increase political uncertainty and put at risk the country’s development gains. On the other hand, a fair election may end authoritarian rule. There are signs that Bangladesh is edging toward the former. Pre-election Dhaka is in a volatile state. Concerns are growing over manipulation of key institutions, such as the election commission, bureaucracy, and the judiciary. Could the 81-year-old eminent Bangladeshi jurist, Hossain, defy the odds and achieve the same feat as the 93-year-old Malaysian maverick, Mahathir? Since the start of the election campaign on December 10, opposition leaders in Bangladesh have come under attack almost on a daily basis. According to local and international media, some campaigning opposition candidates have been publicly beaten by ruling party cadres or sent to jail on false accusation. As many as 21,000 opposition leaders and activists were arrested since the announcement of the election schedule. Ruling party miscreants torched opposition campaign offices, attacked female opposition contestants and accosted a motorcade including Hossain. There are allegations of rampant violation of electoral codes. Instead of ensuring a transparent election, human rights groups have accused the election commission of doing the opposite: Putting up restrictions on election day coverage, such as live cast from voting centers or cellphone recording of irregularities. These, critics argue, are part of a coordinated strategy from the incumbent government to weaken the conditions for a free and fair election. Election violence is not new for Bangladeshis. There were violent street protests after the 10th general election, which led to loss of lives and the damage of public properties. The ruling party accused the opposition of being behind the post-election carnage. This makes the Awami League’s recourse to terror-politics and intimidation on the eve of 11th general election puzzling. The pursuit of fear and intimidation as a pre-election strategy renders unfair advantage to the incumbent. Disruptions to the opposition’s electoral campaign undermines the prospect of a competitive election. It also adversely affects the primary target: voter turnout. Owing to pre-election violence during the 10th general election, voter turnout was as low as 22 percent in the capital city, Dhaka. Hundreds of polling stations were closed early, citing security concerns. According to Human Rights Watch, Bangladesh’s democracy was in the crossfire. Will the current campaign of terror by ruling party politicians and their student cadres adversely affect voters’ decisions to turn up at the polls on December 30? Pre-election violence is not uncommon in autocracies. The experience of electoral violence in African countries such as the Democratic Republic of the Congo and Burundi, however, suggest that it may well have the opposite effect. Voters in South Asia display a strong anti-incumbency attitude. The current spell of public attacks and use of brute force to silence dissenting voices may only reinforce such anti-incumbency feelings and significantly lower the chance of re-election for the Awami League. Development Progress Without Political Progress? Bangladesh has surprised many development commentators by achieving Millennium Development Goal (MDG) targets in a broad range of indicators, despite its adverse geographical conditions and chronically malfunctioning state apparatus. Our research of the country’s achievements since independence confirms progress relative to regional neighbors such as Pakistan and India. However, progress on the political front has been lacking. Contrary to its impressive development records, Bangladesh has regressed toward authoritarian rule as the MDG campaign ended. Bangladesh’s historical record on media freedom and rule of law is poor. This created numerous challenges for democratic traditions, including the ability to organize fair elections. A popular political tradition of organizing peaceful elections under a non-partisan caretaker government was scrapped by the Awami League in 2011. In the same year, founder of the Grameen Bank, Professor Yunus was forced to step down as managing director; additional measures were put in place to bring Grameen Bank under the state control. Protesting against scrapping of the caretaker government system, the largest opposition party boycotted the 10th general election in 2014 — leaving more than half of parliamentary seats uncontested. During the pre- and post-election months, the government security forces launched a brutal crackdown on the opposition. The government has since ruled without being challenged in the parliament and consolidated its power further by indiscriminately jailing leads of parties outside the ruling 14-party coalition. Earlier this year, the court sentenced opposition leader and former Prime Minister Khaleda Zia to five years’ imprisonment. The ongoing violence follows an earlier pattern of repression and the “disappearances” of political opponents. In the past five years, thousands were prosecuted using the infamous Information and Communication Technology Act (ICT Act). The new Digital Security Act passed earlier this year imposed further restrictions on freedom of expression diminishing the role of the press to ensure a transparent election. The Act has largely been used to target the opposition. Last week, however, Facebook and Twitter announced that they had removed accounts and pages linked to the Bangladesh government that had spread anti-opposition fake news. In April 2018, the country witnessed a massive student uprising demanding road safety rules and good governance. The government violently repressed the protests. Ruling party cadres wearing helmets and carrying machetes attacked journalists covering the events. Acclaimed photographer Shahidul Alam suffered 100 days in jail for speaking out in favor of the uprising. Another prominent development leader, Zafrullah Chowdhury, also suffered violence for his support to the opposition alliance. The lack of freedom to protest is also undermining economic justice. In the absence of a credible opposition and press freedom, political corruption and financial irregularities have crippled the banking sector. Political cronies have primarily profited from the country’s booming economy causing much frustrations among the wider population. Inequality is on the rise. While the rate of poverty decline has slowed down in recent years, Bangladesh has made international headlines for having the fasting growing number of ultra-wealthy. The growing rich-poor gap, financial scandals, and patronage politics have overshadowed the country’s development record. Recent developments are clearly part of a longer-term authoritarian trend which may well have consequences for the prospects of further economic and social progress. Conducting a “free election” with “freedom of opposition and expression” guaranteed, according to Amartya Sen, are central to the process of development and are associated with improved living standards. Retaining power through unlawful means, therefore, will be a move in the wrong direction for the incumbent government, as loss of freedoms can only put at risk the development progress achieved since the country’s transition to democracy in 1991 and harm its chances of achieving the global development goals by 2030. Indeed, it goes flatly against one of the Sustainable Development Goals (SDGs), as SDG16 targets require protection of fundamental freedoms, and promotion of the rule of law. Two years from now, Bangladesh will celebrate the 50th anniversary of its hard-earned independence from Pakistan following a brutal war. This December’s election will dishonor millions who sacrificed for the country’s independence in 1971 if it fails to protect the basic political rights and safety of ordinary Bangladeshis. On the other hand, for a nation that takes pride in its history and the struggle for independence, a secure, transparent and fair election will mean victory in its own right. M Niaz Asadullah is Professor of Development Economics at the University of Malaya (Kuala Lumpur) and a Visiting Professorial Fellow at the University of Manchester’s Global Development Institute. Antonio Savoia is a Senior Lecturer in Development Economics at the University of Manchester’s Global Development Institute and researcher at the Effective States and Inclusive Development (ESID) center. What does Hero Alom’s candidacy say about the state of Bangladesh's politics?